Shoujo Manga is filled with fantasy and paranormal series. Just like American teenagers, Japanese teenage girls seem to have an infatuation with vampires. Don't get me wrong, I like my vampires as much as the next girl. In fact, I probably like them even more (Edward Cullen...sigh; Jasper Hale...sigh; Adrian Ivashkov...sign; Christian Ozera...sigh; On the manga side: Zero...sigh). Sometimes, though, I'm in the mood for something a little more realistic. But realistic manga series aren't that easy to find. That's not true exactly - good, realistic manga series are hard to find. 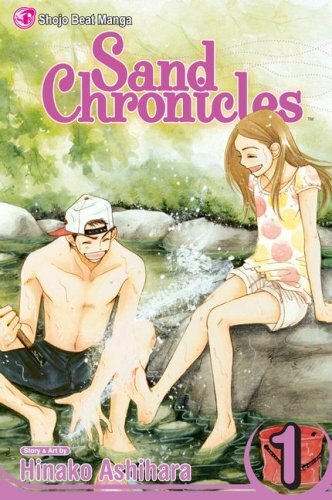 The only realistic series that I've read and really loved was Sand Chronicles by Hinako Asihara. I loved the serious issues that the series dealt with, the depth of the characters, and the tragic, drama-filled romance of Ann and Daigo. It was a bit melodramatic but felt more real than any other series I've read. I want to read more like this one. 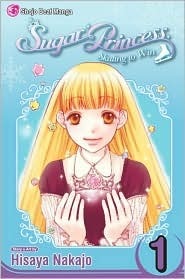 I just read the first volume of Sugar Princess by Hisaya Nakajo. It was cute and contemporary - although I find it hard to call a series where the main character executes a perfect double axle the first time she put on ice skates realistic. These were okay, but I didn't love any of them. Peach Girl and Love*Com both were in the silly/stupid realm to me. Oishinbo was decent, but not in the shoujo world that I like best. What are some good contemporary fiction manga series? Even better if they are serious, not just a flighty romance and dumb jokes. Hey Alison, I'm having issues commenting on your IMM. *lol* But it allowed me to comment here! Any who, thanks for visiting my blog. I know you love Manga; and I've been meaning to ask you if you've heard of the "2012 Manga/Graphic Novel/Video Game Novel Challenge"? If not you should check it out. I definitely have to push the Kimi ni Todoke here too - it's completely sweet and really makes me feel all warmy & mushy inside frequently while still keeping things real. I'm having trouble with the comment box, so I've clicked reply! Skip Beat is fantastic! It's one of my favourites, so it's a definite must read! Beast Master is an amazing 2 volume manga that is one of my all time favourites! Beauty Pop is another favourite! Hmm I could probably rec about 100 more lol but no more have popped up for the moment so I'll have to get back to you! @Kate this is not the first time I see someone recommended A Devil and her Love Song, hmm, added to my TBR shelf! Thanks Julie! I've definitely been meaning to try Skip Beat. I'll have to look up the brownies. @KTJ Thanks for clueing my into A Devil and her Love Song. Looks very interesting. Kimi ni Todoke is rising on my list since lots of you seem to like it. @ KTJ and Alison - Yes, Beauty Pop! That is so funny - I totally forgot about it! Beast Master is good - only two volumes, too! I like Itazura Na Kiss, too. It's an older series. The mangaka sadly died before competing it. I love Library Wars, too! It's not really shoujo, but I think you would enjoy it, too. I have a love/hate relationship is Miki Aihara - her characters are spineless, but I find her stories compellingly readable. Honey Hunt and Hot Gimmick have been released by Viz. Hot Gimmick was great until the last 2 volumes - just a warning. Crimson Hero is about a girl and her love for volleyball. I hate volleyball, but love this series. I think Viz gave up on this one at vol 14, though. Flower in a Storm by Shigeyoshi Takagi is quick and funny, too. I can't answer your question either, but I just have to say how much I love how wide the girl's mouth is on the cover of Sand Chronicles:) It's funny how they have huge, gaping mouths but no teeth. That's completely random and not helpful at all to your question, but there it is:) The illustrations are beautiful though, I wish I could draw characters like that! Girl, I wish I could help you with your question, but I'm less than a newbie...I'm a wannabe newbie when it comes to manga! Can you recommend any good manga to just dip my toes in the water? Thanks for the recs! I haven't heard of these. Hmmm...I really can't think of any good contemporary manga that is...normal. Isn't that sad? But you have two good picks here, and I will be on the lookout for you. Koizora (grab your tissues): high school, serious love story. Watashitachi no shiawasena jikan: short, tough and sweet. I think you might like it! Do let me know what you think if you check them out! Thanks Ron! Koizora definitely sounds up my alley. I enjoy MM because even though it's a genre I don't read, I like knowing what is out there...like I had not clue that Contemporary Manga existed. So cool. I'm happy to see others sharing their love for manga. I always think it's the other way around--that shojo manga is heavy in realism. I'd suggest Skip Beat! (this one is THE best out there, for real), Ouran High School Host Club, Absolute Boyfriend (currently reading-is really good), High School Debut (very cute), The Wallflower (love this anime), The Story of Saiunkoku, Kimi ni Todoke (which I hear fab things about). Realism is all the rage! Ouran High School Host Club is one that I've been wanting to start. Everyone raves about it. Skip Beat too. @Cathy & Alison - another great series I completely forgot about - I 2nd the recommendation for High School Debut. The Wallflower is good, too, but it gets repetitive. It's great in small doses. *claps hands* I've read a couple of those and really enjoyed them! One contemporary I LOVE (though it kinda went a little scifi toward the end) was Weiss Kreuz about four young assassins, each with a painful secret in their past that they feel driven to seek redemption for. They also made an animated series out of it (I discovered that before the manga) and just can't say enough good things about this series! I definitely agree on Kimi ni Todoke and Ouran High School Host Club! They're both fantastic, cute, and super hilarious. I'd also recommend We Were There, which won an award, and Nodame Cantabile, which is a hilarious slice of life type of story about two musicians and all of their equally quirky friends. If you're looking for something more gritty and mature, I'd recommend Life by Keiko Suenobu. I haven't read it yet, but I read a oneshot by the author, and my sister said that it was basically a shorter version of what Life was about, which was pretty surprising since it was so intense and realistic. I am super stoked about this. I've been telling myself I need to start reading one manga a week since I've been neglecting them lately. This is just the push I needed! another favorite is Parfait Tic! , this one is AMAZING, but the last couple of volumes haven't been released in english yet so i am impatiently waiting for them.